"Launched and enthusiastically received at the first annual Halifax Seaport Beer Fest in August 2007, this ale has quickly become known as the hoppiest beer in Atlantic Canada! Unfiltered Imperial I.P.A. 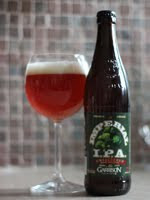 is a robust, full-bodied and complex brew in the Double IPA style. An intensely fruity aroma combines nicely with a malty caramel backbone, clear hop bitterness and lingering citrusy finish. This beer is for the true hophead!" This beer pours a gorgeous golden orange like a fiery sunset. A generous two fingers of fluffy tan/khaki cloured head. Nice peaks and small bubbles with a decent effervescence streaming from the glass. Hop haze and unfiltered. Stunning. Tangerine and grapefruit dominate the nose. They slowly subside to a wonderful sweet maltiness. This beer smells mouthwateringly good. The smoothness of this beer is incredible. As it washes over your tongue, you are rewarded with those huge citrus flavours you would expect from a North American Imperial IPA. Undertones of a piney bitterness smack the top and sides of the mouth through the finish. Wonderful! I must admit that I have been excited to try this beer after sampling Garrison's wonderful Hopyard IPA (click here for review). Even with high expectations, I was not disappointed. The big citrus and piney bitterness is balanced well with the slight sweetness of the malt backbone. This would be right up there with you Maharajah's and Hopslam's. I would rate this an "A+". Rumour has it that several limited edition Garrison brews are heading to Ontario. I'm going to be first in line. Can't wait to see what they do with a stout. Vote for Your Benefit Brew Now!